Re: What's Faster (FileHelperEngine or FileHelperAsyncEngine) ? Thanks to you for the comments, are really nice !! This issue is really extrange I allways think that is better to work on similar things to get better berformance, i.e. if you work with your records and add them to an array and later you write in once step the caching system must work better. But, like allways with computers, the async engine works better on the most of situations because you their use less memory and because you loop only once through your records. Any way I´m talking most on the PC version I don´t have any .NET compact framework device to test the real performance. If you get any result please submit it to me. Any feedback is welcome, thanks for help !!! i.e., the sign and decimal point are not separate characters. If this is not a current feature, it sure would make a good one for future versions. Just to follow up, this is the custom converter that I came up with. '// Not sure why I must leave this in - don't understand MustInherit keyword / implementation. ret = Left(ret, Len(ret) - 1) & "}"
ret = Left(ret, Len(ret) - 1) & "J"
ret = Left(ret, Len(ret) - 1) & "K"
ret = Left(ret, Len(ret) - 1) & "L"
ret = Left(ret, Len(ret) - 1) & "M"
ret = Left(ret, Len(ret) - 1) & "N"
ret = Left(ret, Len(ret) - 1) & "O"
ret = Left(ret, Len(ret) - 1) & "P"
ret = Left(ret, Len(ret) - 1) & "Q"
ret = Left(ret, Len(ret) - 1) & "R"
from = Left(from, Len(from) - 1) & "0"
from = Left(from, Len(from) - 1) & "1"
A question.. this is a common format in the mainframe files, I´m thinking for a while to add a set of common converters to the lib if you have any other suggest to me. I just stumbled upon your library by chance. I was in the process of building my own for a project I'm working on, but your library looks like it might fit the bill. The tricky part is that the 'item' records between the header and trailer are optional. Therefore a file can consist of a header and trailer or header, item(s), trailer. Does your library support the above scenario? 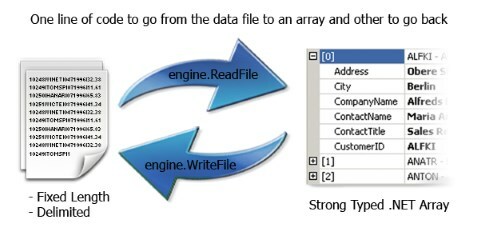 and the engine ignore this header and trailer data and store them in the engine.HeaderText and engine.FooterText. later you can use this strings to get useful data. This work too if there is no items in the files !!! Thank you for the reply. I'll give that try. I'm getting an exception: Constructor with 0 arguments of type DecimalConverter not found !! Not sure what to use as a second parameter. I'm trying to get 0000001299 as the resulting string. Do I need to create a custom converter for this? I'm using version 1.3.5. Thanks again Marcos, your library is saving us so much devlopment time. Was sondering if there is a way to supply additional connection string information. I havea client that is using work group (.MDW) security and I need to provide that information (.MDW and User ID). Thanks again Marcos! This is a great tool. I´m comming back to the work and adding some new features to the library. - IgnoreIfContains: an attribute to ignore lines that contains some string. 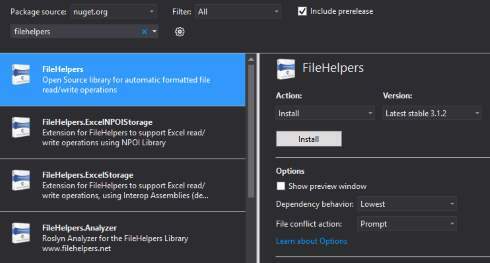 - Diff Support: an option to compare two datastorages and generate a file with the differences. - Header Footer Engine a new engine to support different records for the headerand for the footer. How about generating the record class on the bassis of the "top line" / header of the input file ? Is that possible ? You said an option to read files with an unknow format ? I meant reading of data from an XLS or a CSV file. Most applications have an import functionality, where you provide a Excel file which has the top line containing the Column names. Then you map the column names with your DB names. Is there a way to do this right now ? If not a great feature would be the generation of the record class on basis of the data in the Excel/CSV file. Re: What to add next to the lib ? 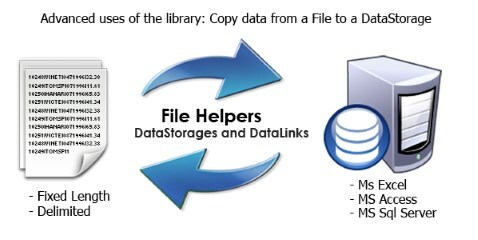 The problem of importing data from a CSV af an unknow format is that the purpouse of the library is strong type a flat file accessing it by Field with the right type, then I must to so a lot of change to support this different approuch... I try to get an idea of how to mesh all together. Yes now that I understand to grey are similar things. Sory jyjohnson for forget that feature... is not really complex to implement and really useful. mmmm... I need to get an internet conection at home to check this pending tasks, in my country (argentina) all the people go to cybercafe that are only machines with Internet (not caffe at all to use internet... this make me to forget things like this. Progress notification would be pretty cool too, as would Async Reading of Excel Files. I'd like to see the ability to handle lines that are not the complete length. I get a file with fixed line length that only populates to the last not empty field. So if there are 30 fields, but the last one with a value is 25, the line is truncated for the last 5. You are right the solution to it are the Optional Fields, I try to add it as one of the next features then you can put the optional over the last fields and the problem is solved. I really love this tool, but I'm running into trouble when trying to developer my own custom conversion routine. I'm having trouble with the following code. My C# to VB.NET skills are lacking. No errors, just not running my conversion code. Dim ret As String = "99"